I went ergo this year. 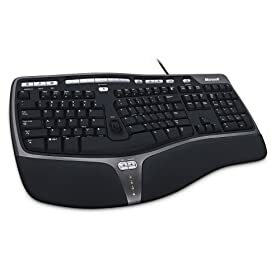 I upgraded to dual monitors, got a monitor stand, an ergonomic keyboard, and then the ergo mouse – then threw out my original right handed ergo mouse so I could mouse goofy (use my left hand for mousing). The ergo keyboard was the hardest to master. I unfortunately learned how to type while enthralled with mIRC and ICQ – this was well before the touch typing classes of high school. Since I never really learned how to type, I had evolved a pseudo typing approach. Sure, I always kept my hands on the home row, but they were always off by one vertical row of keys – my left hand would reach for the Y,H,N keys which should normally be controlled by the right hand. My pseudo typing speed was average, but using the new ergo keyboard was a huge challenge – my left hand kept trying to straddle the gap to reach the Y,H,N keys. Relearning touch typing on the ergo keyboard was frustrating, but it now feels natural and I'm surpassing my old average typing speed. The ergo mouse was pretty straight forward, within a week I was feeling confident with my precision. Switching hands and using a left hand ergo mouse was more difficult. I often catch myself reaching for my left mouse, like reaching for the stick shift in an automatic car after driving standard. My precision is still off a little, but the position on the left is closer to my keyboard and more natural for my arm and shoulder. Since I try to use my mouse as little as possible, switching hands was also an incentive to learn more keystrokes. Ergonomics are important for a sustainable and physically tolerable career in computers. Do you use any ergonomic products? Opera's native mouse gesture capabilities originally introduced me to gestures (mouse gestures basically let you control functionality through mouse button click combinations and mouse strokes). I used Firefox's mouse gesture plug-in for a while, but after acquiring a five button mouse and using browsers with five button support I find mouse gestures useless. Do you use mouse gestures or a five button mouse?